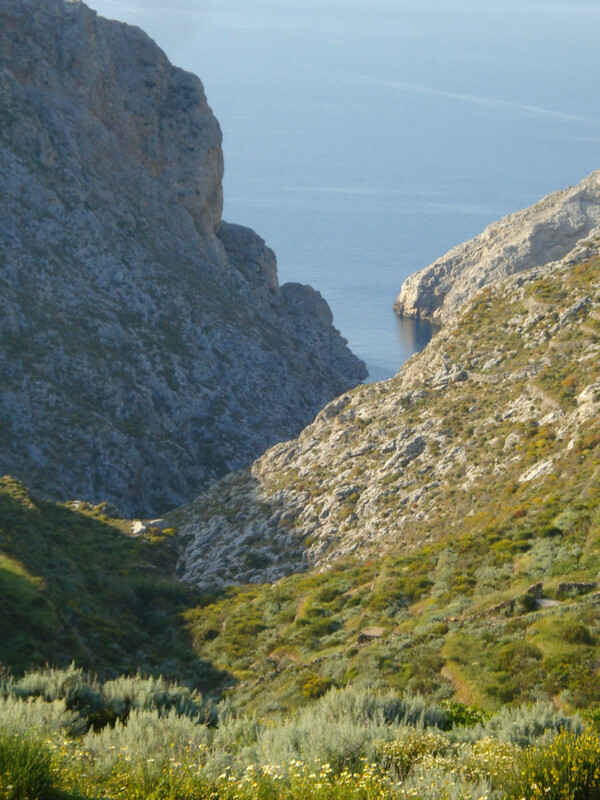 The northward branch of the asphalt road from Kamari ends after 1km at the village of Vroutsi (17.5km), from where it is a steep, 30-minute descent by foot to the site of Ancient Arkesine. 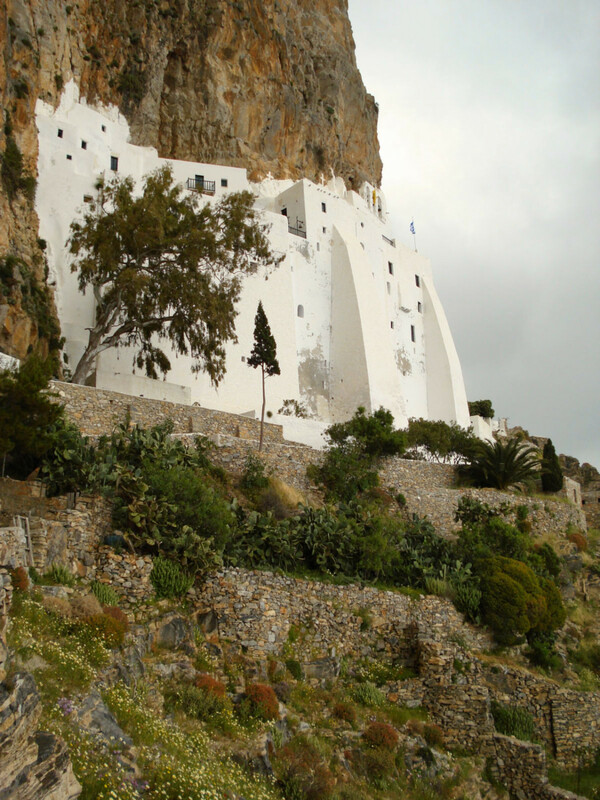 On the descent, the path passes below the large, modern church of Aghios Ioannis Apokephalisti­s (‘St John the Beheaded’); it is dramatically sited on a prominent bluff on the hillside which is believed to have been occupied in antiquity by a sanctuary of Athena Itonia (an unusual epithet for the goddess, associating her cult here with that in the city of Iton in Phthiotis). 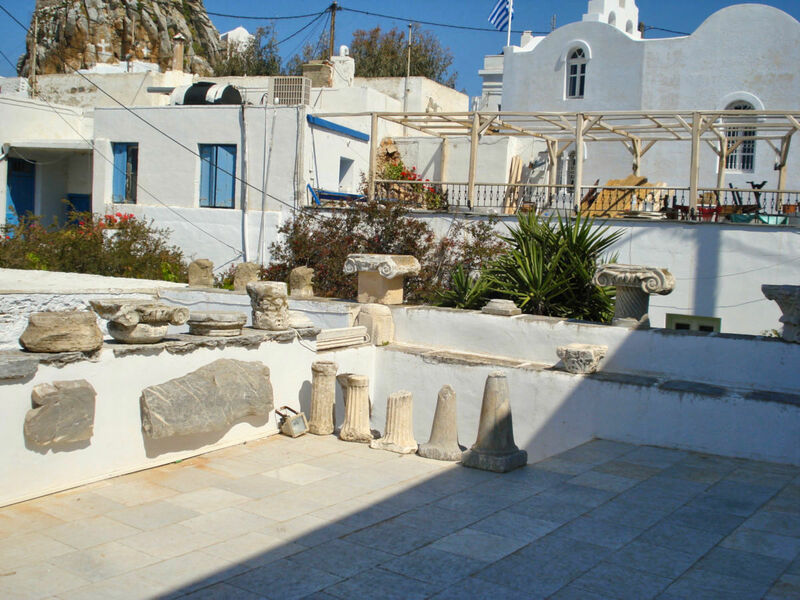 Arkesine, founded by settlers from Naxos in the 8th century bc occupies an exposed and panoramic promontory of the north coast: Donousa lies directly ahead; Naxos , Keros and Herakleia to the west; and the long extent of the rest of the island, to the east. 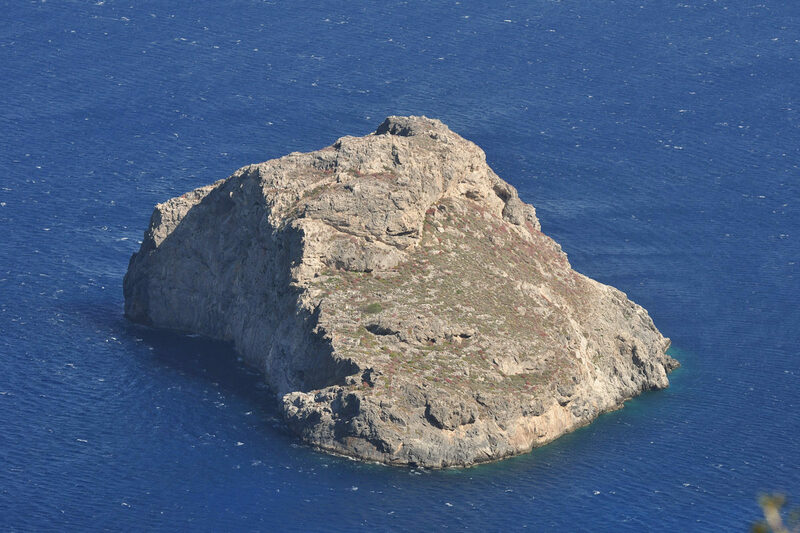 The natural site provides a promontory, capped with a limestone outcrop ideal for fortification as an acropolis; but it offers little that could have functioned as a protected harbour nearby. 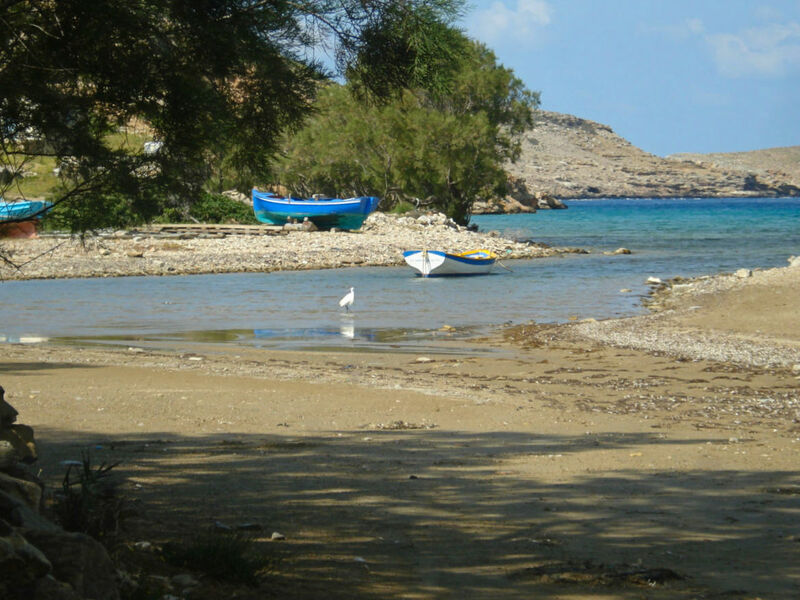 The city’s main out-port must have been at some distance—perhaps even as far as Kato Kambos Bay to the west. As you descend the path, the best preserved stretch of fortification wall can be seen below and to the right of the acropolis rock, in large isodomic masonry with later walling built on top. 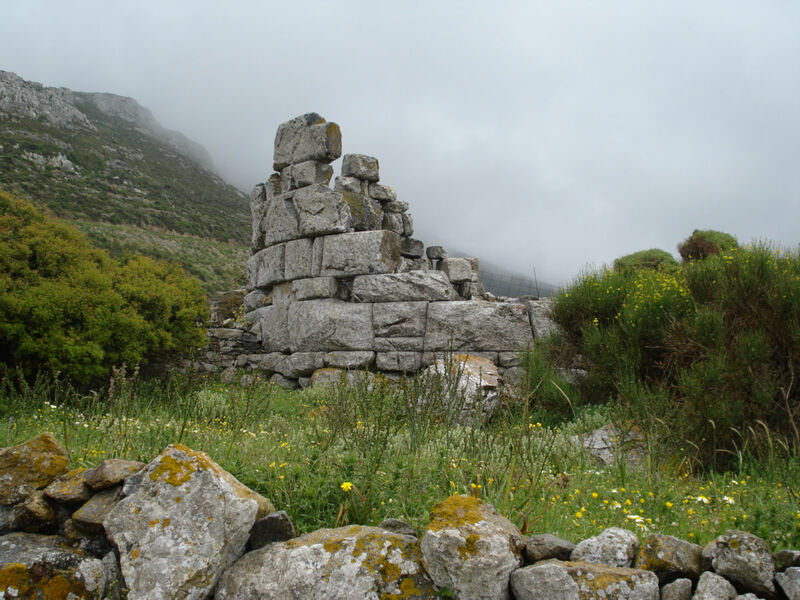 Further well-conserved elements of the bastions and fortifications lie further round the steep, eastern side of the promontory and are best seen from the summit above. 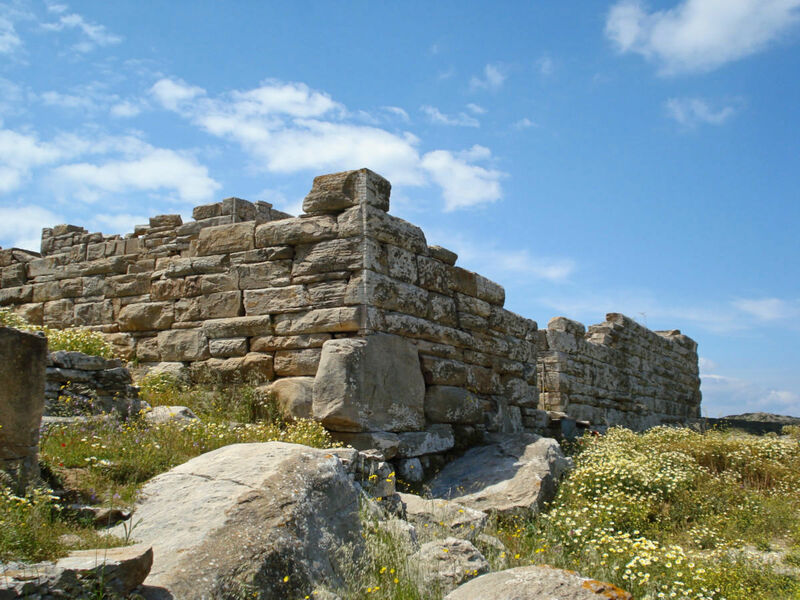 In spite of the city’s importance in Antiquity, little remains visible other than fortifications and gates. 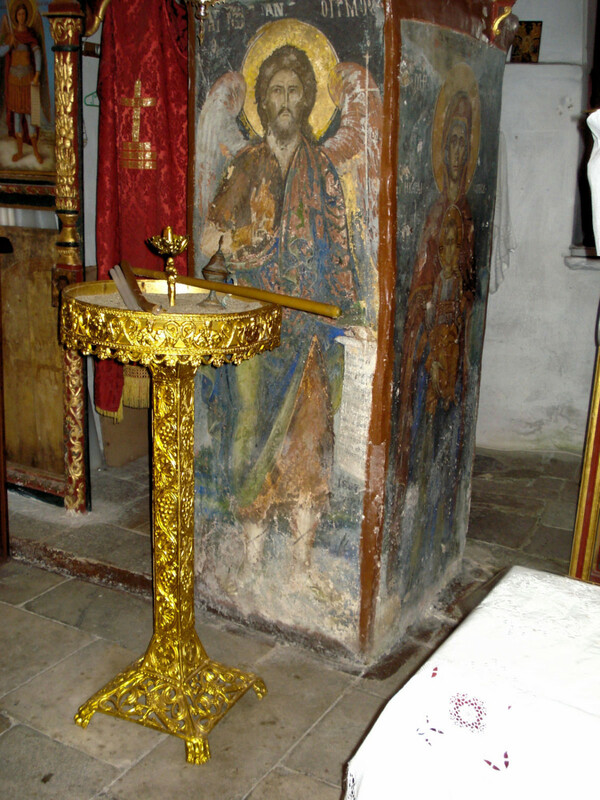 The acropolis today is occupied by the remains of a fortified, mediaeval kastro: the cisterns and millstonesly around are mediaeval; most of the potsherd-scatter is mediaeval, too; but some of the constructions, such as that opposite the front of the church of the Panaghia Kastriani­, incorporate ancient blocks bearing inscriptions. The site awaits proper excavation. 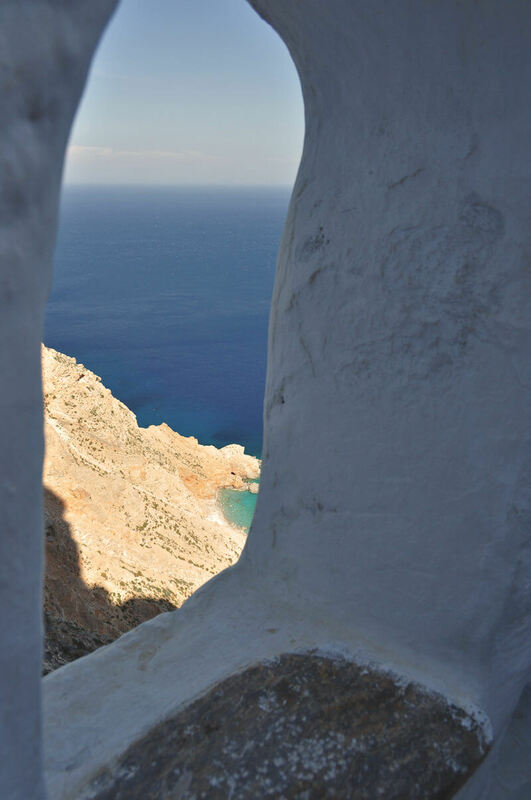 Amorgos Island is part of the Cyclades Island Group, Greece. 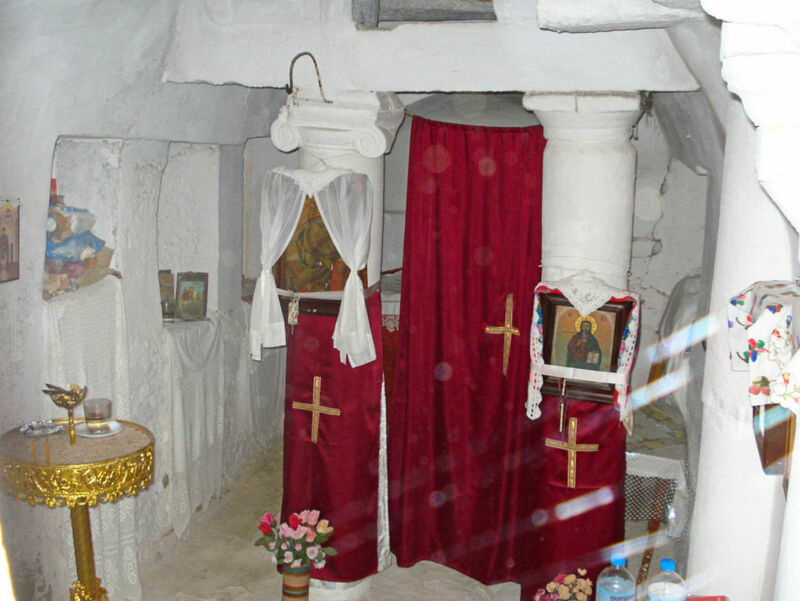 Lila Marangou, The Monastery of the Panaghia Khozoviotissa, Athens 2005. 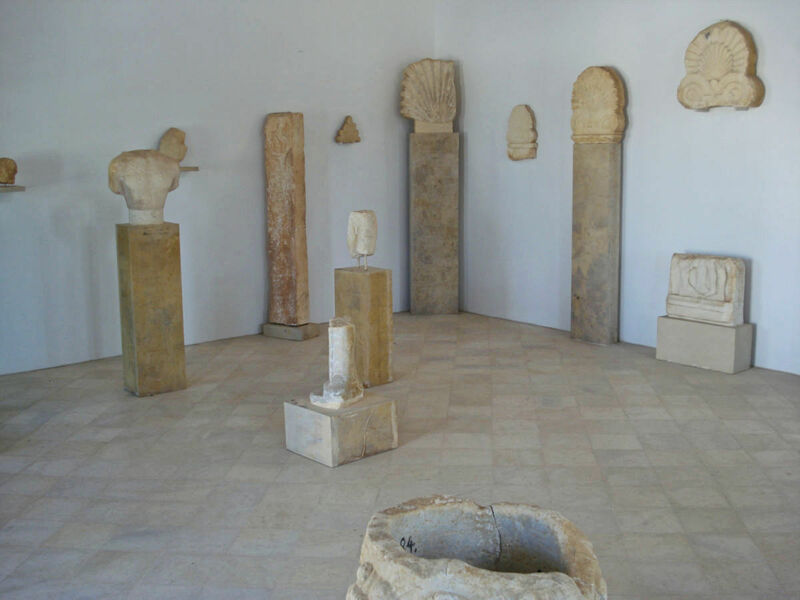 The author is indebted to the writings of Prof. Lila Marangou on archaeological matters which constitute the most complete and authoritative account of the island’s monuments. 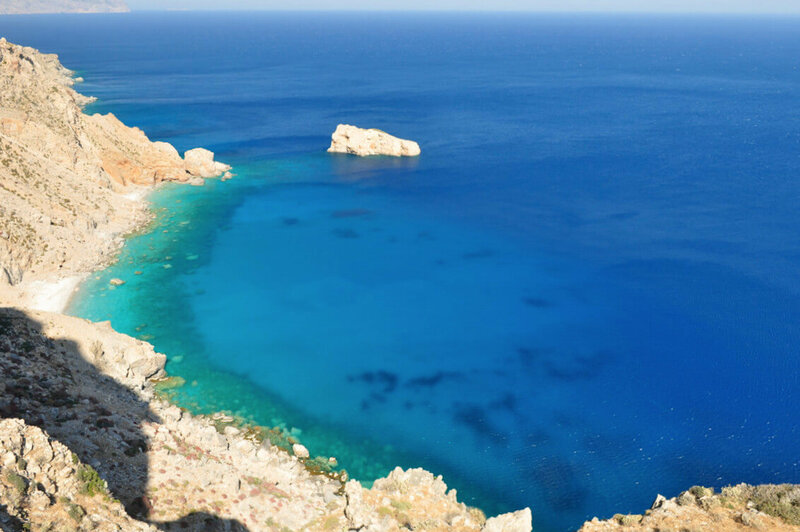 Agia Anna beach, famous for its blue crystal clear waters. In this location, scenes of the movie “Le grand blue” (The big blue, 1988) were filmed. 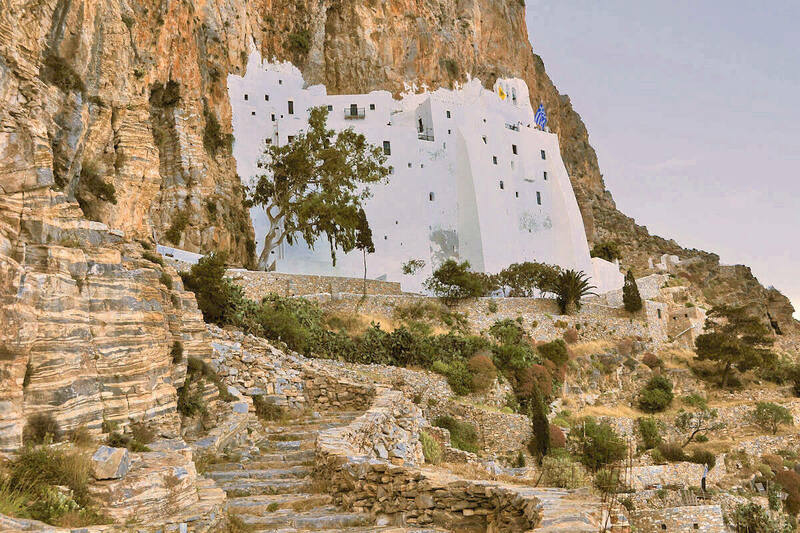 Amorgos lies at the terminus of a ferry-route; it is a mini mum 7–8 hr journey (often longer) between Piraeus and the island, with several stops en route—always include either Naxos or Paros. 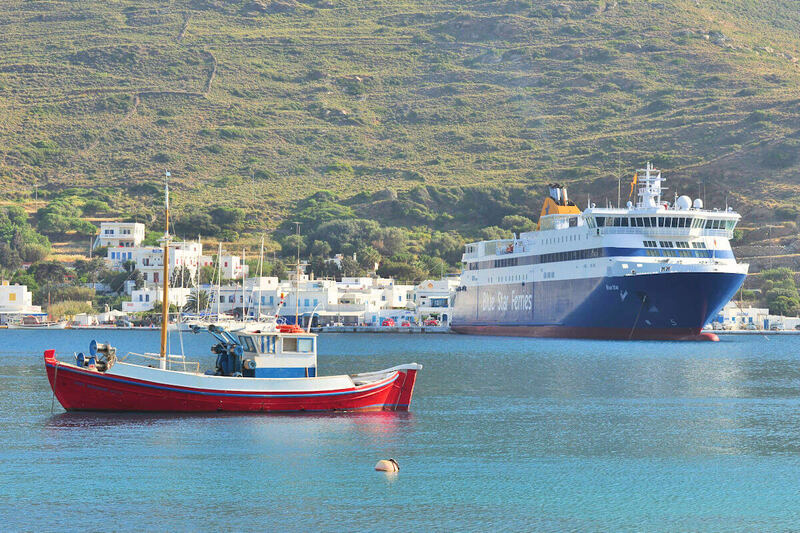 Blue Star Ferries operates the service daily in the summer and five days a week in winter, alternating between the island’s two ports: Katápola, the principal destination, in the centre, and Aigiáli (“Egiáli”, “Yáli”) 20km further north. 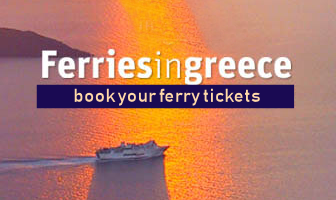 It is important for any itinerary to establish which of the two is the port of arrival/departure. 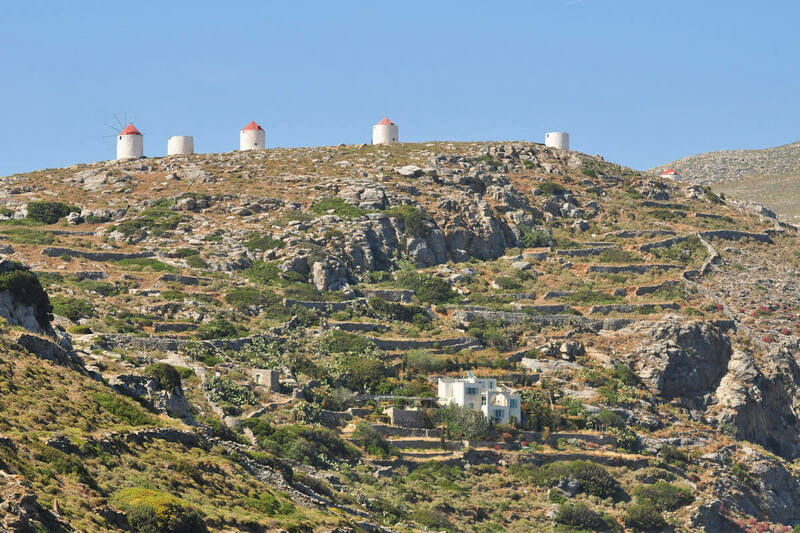 Blue Star also connects Aigiáli (only) with Astypalaia three times weekly. 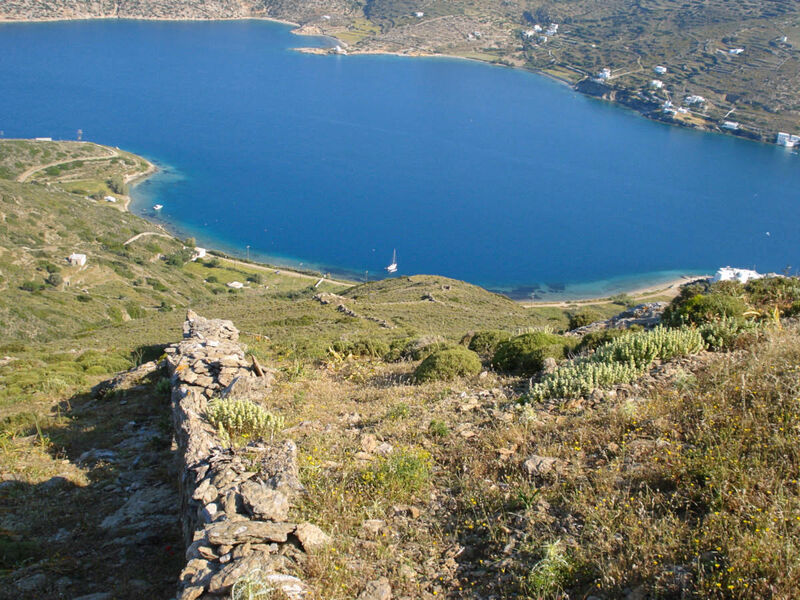 The F/B Express Skopelitis, based in Katápola, plies through the Lesser Cyclades to Naxos and returns daily in summer, always stopping at Koufonisi, Schoinousa and Herakleia en route, also including Aigiáli and Donousa three times weekly. 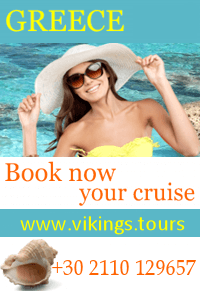 The service runs from April–end Oct, weather permitting. The Blue Star services maintain connections with these smaller islands 2–3 times a week in winter. and the more conventional Hotel Vigla (T. 22850 73288, fax 73332, www.vigla-hotel. 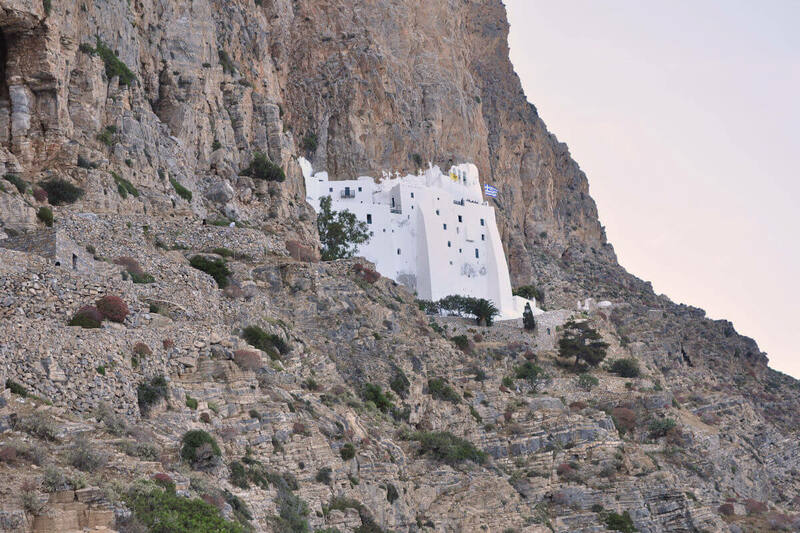 amorgos.net) in the hill-town of Tholaria, above Aigiáli. 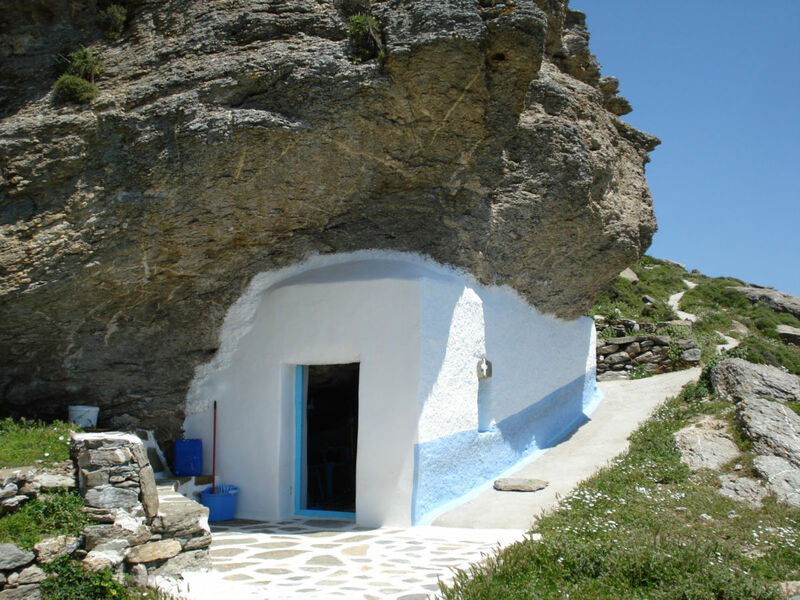 Offering simpler facilities, are: the Pension Amorgos on the harbour-front of Katapola (same management and numbers as Emprostiada above); in the village of Langáda, Artemis Rooms (T. 22850 73226, www.amorgos studios.amorgos.net; open all year); the same owners also rent rooms on the beach near Aigiáli. 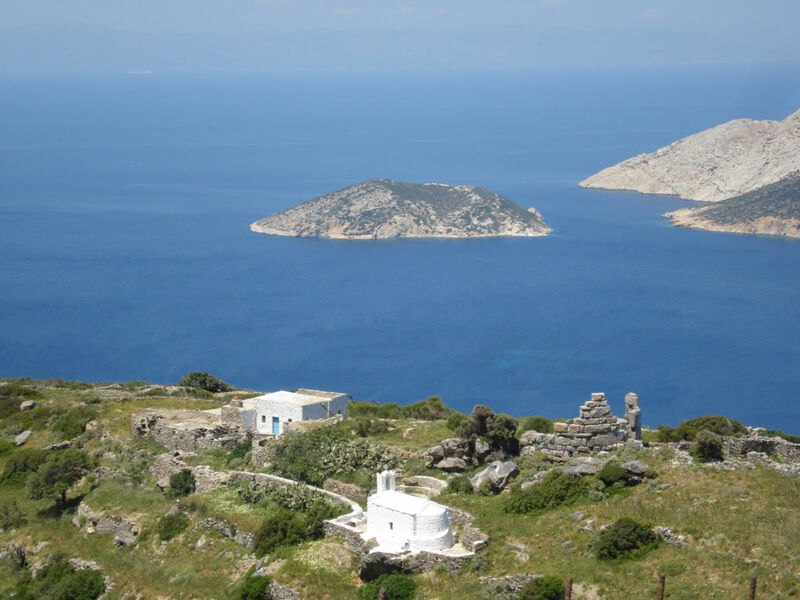 Highly recommended for visits to Amorgos based around walking, riding, historic sightseeing, botanising and bird-watching, are – Special Interest Holidays who offer an excellent range of civilised activities and places to stay (T. 693 982 0828, www.special-interest-holidays.com). 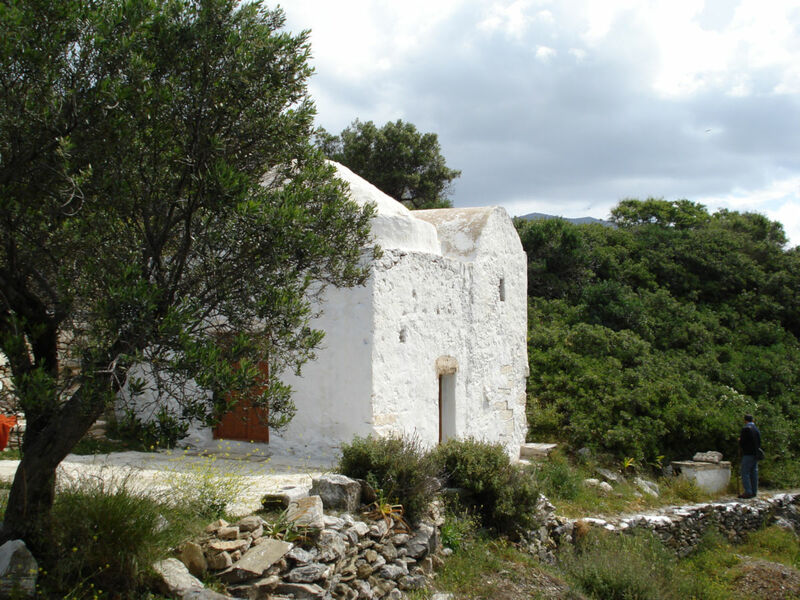 the taverna Giorgalinis in Vroútsi and Marouso in Arkesíni (Chorió), in the west; or Sandouraki in Tholaria at the north end of the island. 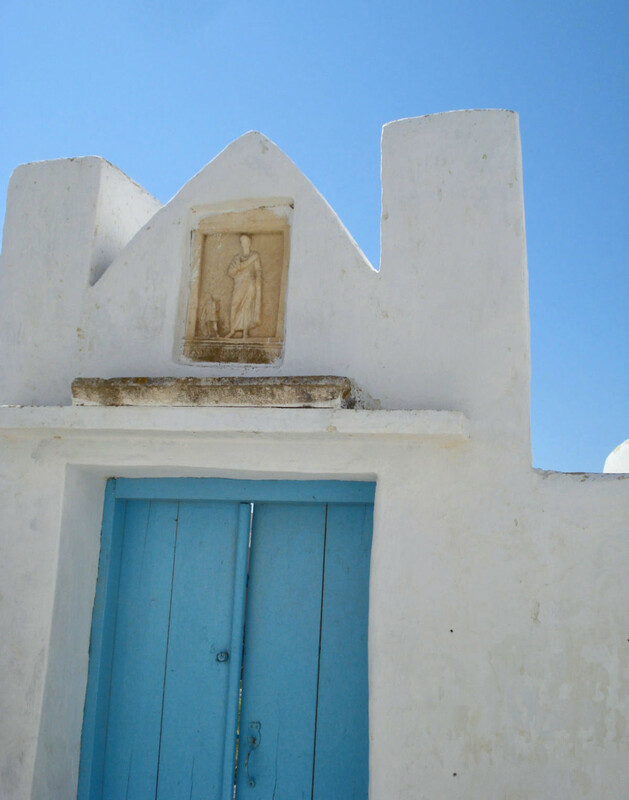 Katina’s To Limani at Aigiáli serves some of the best seasonal and traditional Greek fare on the island, and is popular with local families, especially on Sundays. 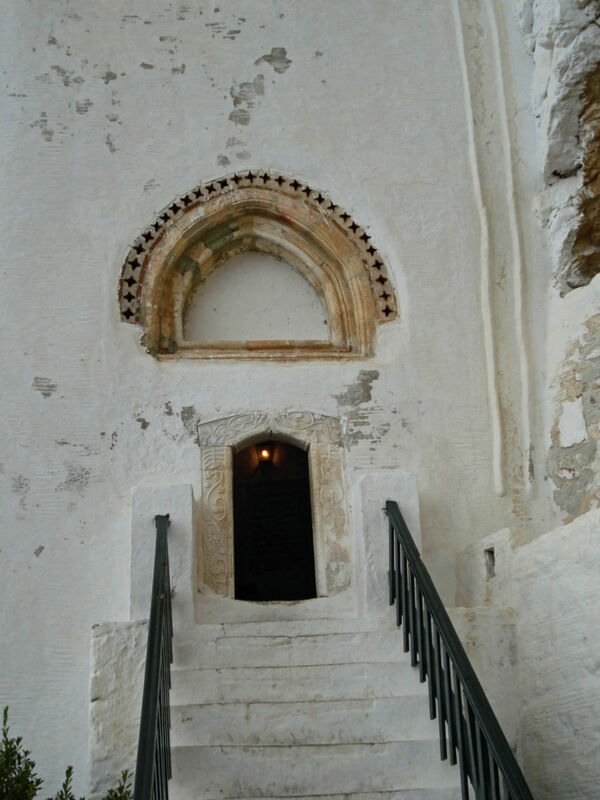 More rarified, but offering some interesting mezes, is To Chima in the heart of Chora.